Confession. I have not updated a single bedroom to “blog worthy” yet in the new house. And yes, if you are paying attention, we have been here almost a year. #bloggerfail (If you want to see the rooms completed so far, see the room by room home tour here.) 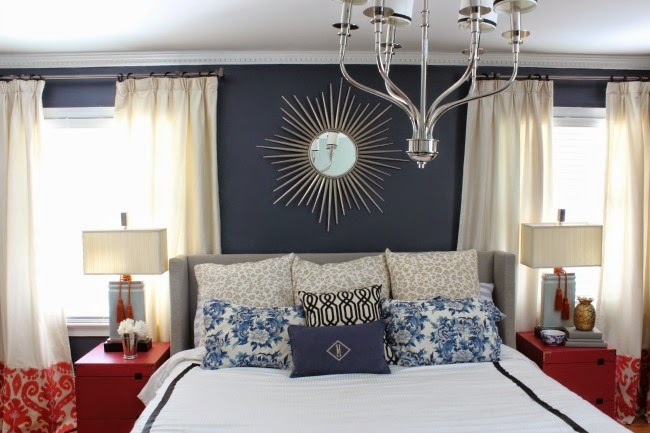 So when Tammy from Pink Peppermint Designs asked me join her Beautiful Bedroom Tour, I figured it was a good excuse to walk down memory lane and show our master bedroom in our previous home. And since our current master bedroom needs some attention, I can’t wait to take a look at everyone’s rooms linked up below for some great inspiration to get started on the master bedroom in our new home. What is it about a master bedroom that makes them always get pushed to the end of the line to get any attention? I think I had decorated two nurseries and one big boy room in our last house before I finally got around to making the master bedroom presentable. But I finally tackled it during a One Room Challenge and loved how bold and colorful it turned out! This room makeover was a tale of repurposing items I already had, finding a few yard sale treasures, a little elbow grease and a vision. I hope you find some inspiration! Warning- picture overload below…. Be sure to check out all of the great bedrooms below! Such a gorgeous room! Sometimes we all need the ORC to get us moving! Love the colors! Love how beautiful the red white and blue look in this room, and that closet wall is amazing. Loving the mix of patterns and colors in here! Such a beautiful share! 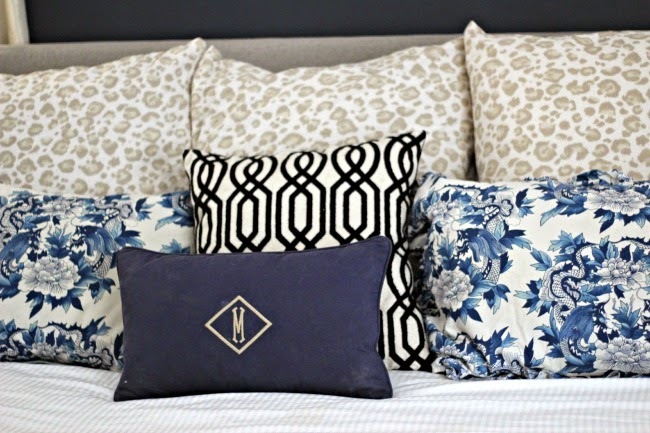 I am totally crushing on those animal print pillows and the navy blue! You have created a beautiful bedroom for sure! I am glad to have found your blog via collaborating on the Beautiful Bedrooms Tour. Have a great weekend ahead!